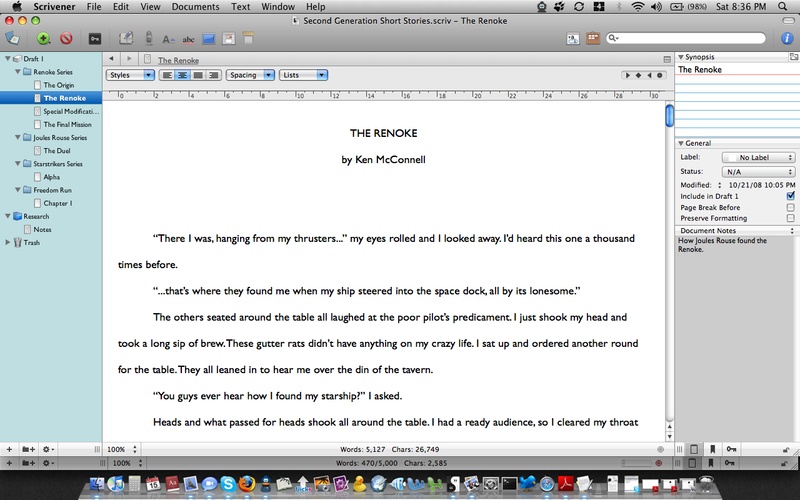 Last year I decided to move to Scrivener the fantastic novel writing program for Macs only. Since all of my writing happens on my MacBook, that decision was a good one. 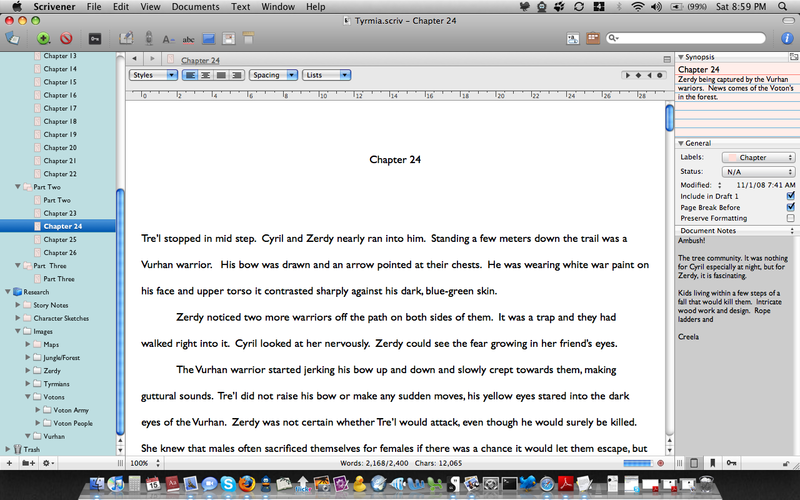 I have been writing my third novel in Scrivener this year and I have to say, its been great. So good in fact, I am moving all my short stories into Scrivener. I have created projects for groups of my short stories that are related. For instance, since I write primarily SF, I have a project for all the stories that take place in my current novel’s universe. I have another project for miscellaneous short stories that do not take place in that universe. Every time I come up with a new short story, they will be a new chapter in the short story project. I used to write my short stories in Word or Gedit, but now I keep them all together and divided into folders within the project. This makes things easy to find and keep organized. Scrivener lets me also save notes, and pictures related to my stories. Essentially keeping all my research in one place so I don’t have to run around looking for things when I forget where my notes are for a particular scene or a character sketch. You don’t need to use Scrivener for such organizing. You can accomplish the same task with several very excellent Windows based programs. What matters is that you keep yourself organized so that you can stay on task and write your stories. For larger projects, like novels, it really pays to be organized. Many programs like Scrivener help you in more ways than one. They have outlines built in and places to put photos and notes. I don’t know how I would live without Scrivener anymore. It keeps chapter notes, a simple outline and the actual chapter all together in one screen. Deep in a complicated novel with lots of characters and intricate plot lines, this kind of organization really helps. Here is a screen shot from Tyrmia, my WIP. You can see all the areas of the program in use for this SF novel. I was posting a picture like this every couple of weeks on my blog, so show proof that I was actually writing and making progress. Perhaps I should continue doing that.